Hands On Bike: Part 8: Cheap Bikes vs Premium Bikes: What is the Difference? Part 8: Cheap Bikes vs Premium Bikes: What is the Difference? This is the final instalment of the bike comparison series! In the previous parts, we have already discussed and compared the other major components on the bicycle. The detailed analysis and comparisons can be found at the links below. Today, we shall compare the rest of the components on the bike. Besides the major ones like the braking system or the drivetrain, we will take a closer look at the folding joints and some other miscellaneous stuff on the bike, which may seem insignificant but are actually rather important. For a folding bike that folds into half like the Aleoca Ready2Ride or the Dahon MuP8, there are a few main joints/mechanisms on the bike that enables folding. By folding the frame into half and then folding down the handlepost, it will make the folded package rather compact. 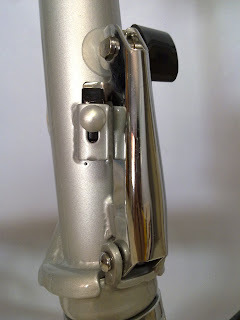 The seatpost is also lowered to be the third leg that stabilises the folded bike. The main frame joint is very important here, as it is crucial to keeping the bike in one piece, and needs to be strong enough to prevent frame flex. Taking into account the rider's weight, and maybe some luggage, the frame joint needs to be large in order to hold the front and rear part of the frame together tightly. Type of quick release skewer clamp found on the Aleoca R2R frame. Frame clamp on Dahon MuP8. See how tall and big the metal clamp is! The frame clamp when opened. Ingenious construction with precision machined components to ensure that the two halves fit together snugly. From the pictures, it can be clearly seen that the huge frame joint of the Dahon MuP8 is much stronger than the frame joint on the Aleoca R2R. It is hard to explain the physics of the frame joint here in words, but to put it simply, the Aleoca R2R's quick release frame joint is definitely not ideal for taking on the heavy loads acting on the joint. This results in a flexible frame that will twist from side to side as you pedal hard. On the other hand, the large metal clamp on the Dahon MuP8 has a much larger clamping area, and is also taller, which makes the two halves of the frame fit very tightly to each other, and helps to maintain the stiffness of the frame. In my opinion, this frame joint is one of the main reasons why the MuP8's frame is much better than the Aleoca R2R's frame. Poor components can be upgraded, but you cannot change the frame, else you might as well change a new bike. The excellent frame joint is one of the reasons why the MuP8 is worth much more than the Aleoca R2R. 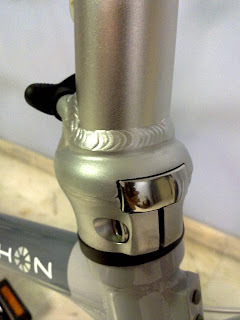 Handlepost joint on the Aleoca R2R. Also found on many other folding bikes, even the new Tern bikes. 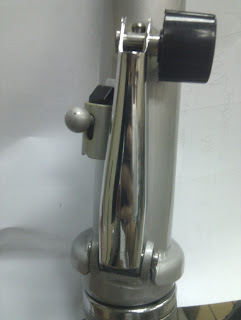 There is a hidden vertical metal rod that pushes the top half of the handlepost onto the bottom half. Radius handlepost with V-clamp lever seen at the bottom. Big stainless steel clamp that clamps the top and bottom half of the handlepost together. Similar construction to the frame clamp of the MuP8. I used to think that the traditional handlepost clamp is inferior to the new V-clamp handlepost hinge used by Dahon, which is why Dahon has been phasing out the traditional handlepost clamp found on the older Dahon Eco 2/3 bikes. However, after Tern bikes began using this construction on their handleposts, I realised that the traditional handlepost clamp can also be very strong! 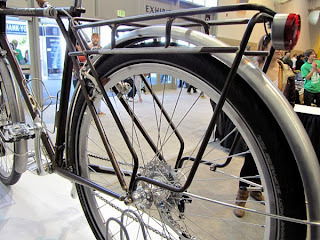 This can be seen in the excellent handleposts made by Tern for their bicycles. In any case, Tern has already improved greatly on the design of the traditional handlepost clamp. However, the older one found on the Aleoca R2R is not good enough to ensure sufficient stiffness in the handlepost. The main culprit here is the hinge on the handlepost. The hinge that links the two parts of the handlepost must be well engineered to tight tolerances, to prevent any play. This hinge cannot be adjusted, so once it wears out and develops play, there is no way to tighten up the handlepost properly. Whereas on the Dahon V-clamp handlepost, the whole mechanism is much more robust when compared to the one on the Aleoca R2R. There is minimal play when the handlepost hinge is properly adjusted and tightened. 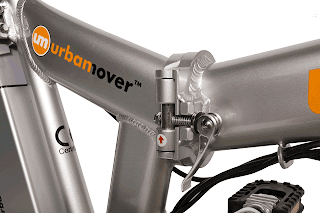 This handlepost hinge can also be considered part of the frame, as it is proprietary to Dahon and cannot be swapped out for a handlepost from other folding bikes. A lot of people have the misconception that folding bikes always come with flexible handleposts. However, a stiff and strong handlepost is possible, just that it will cost more to develop and produce. Which is why the Dahon MuP8 is a premium bike, because it comes with frame technologies that are specially developed for folding bikes. There are other components on the bike which do not fall into any specific category. Here, I have listed out some components/accessories which I feel are really useful and worth mentioning. Biologic Postpump Seatpost. Use the saddle as the handle for pumping! This is an ingenious pump that hides inside your seatpost. It does not take up any space on the bike, such as a frame mounted pump, and yet is powerful enough to be used like a standard floor pump. People are always amazed when you draw out your seatpost, and flip out the pump to use! One drawback is that there is no pressure gauge on the pump, but then again how many portable pumps come with a pressure gauge? Best of all, it only weighs 100+ grams more than the stock seatpost without a pump. Definitely a value-adding accessory that comes with the Dahon MuP8. When folded, the magnet on one half of the frame will stick to the metal plate on the other half, keeping the folded bike together neatly. There is no need to take out a velcro strap to tie the folded bike together. With the magnets, the bike folds quickly and can also be unfolded quickly. You won't know how useful it is until you have used it! Magnet on springs on one side (to absorb the impact when the two sides come together) and a steel plate on the other side. There are also other factors that affect the quality of the frame, such as the dimensional precision of the parts the make up the frame, the welding quality, or the quality control that determines if the frame passes the strength test. However, there is insufficient information available to compare these things, so they will not be discussed. What we do know is that for Dahon bikes, the dealer/bike shop that is selling the bikes need to go through the checklist as shown below, before the bike can be delivered to the customer. For every Dahon bike that the dealer sells, they have to go through this checklist before the bike can be handed over to the customer. This is necessary because when the bikes are delivered around the world, it is almost unavoidable that there will be some rough handling of the boxes containing the bikes. By tuning the bikes and checking them for damage, it ensures that the customer gets a bike that can be ridden out of the shop in good condition, which is especially important for a folding bike that has many more joints and parts than a normal full sized bike. At MyBikeShop, or any authorised Dahon dealer, whenever a new batch of Dahon bikes arrive, the numerous boxes of bikes are always taken out one by one, and each bike will be taken out and inspected. Basic tuning such as the gear shifting will be done at this time. The bike is then placed back into the box, fully tuned and ready for delivery! When the customer buys a bike, the bike is then brought out of the box again, unwrapped, and then checked again to ensure that the bike has been tuned properly. The mechanic will run the bike through the checklist either during the initial check, or when the bike has been unwrapped for delivery. If you buy a Dahon bike from overseas, it is unlikely that these checks will be made. There is no warranty, and therefore no obligation for the bike shop to do this, as you will not fly back to the country if anything goes wrong with the bike. The onus is wholly on the customer to make sure that the bike is properly tuned and adjusted. I have seen instances whereby new Dahon bikes have been brought back to Singapore from overseas, but have been plagued with several problems. These problems include loose pedals, warped bashguards, poorly adjusted hinges and clamps, that may pose serious problems if not remedied quickly. Unless you know your bike well, and have the ability to service your bike completely, it is not advisable to bring in bikes from overseas, bypassing the quality checks that are done by the bike shop. This checklist can actually be found in the Dahon manual that comes with every new bike. Has anyone actually read that manual? In any case, I have included the checklist here for your reference. This checklist is not restricted to Dahon folding bikes! In fact, most of the items on the list are applicable to other bikes. You may want to print out the checklist and use it to inspect or service your bikes. And here we are at the final part of the bike comparison article! I have made every effort to ensure that the facts are correct, and that the comparison is as fair as possible. To answer the question: Cheap Bikes vs Premium Bikes, What is the Difference? The main components that come to mind when I compare the Aleoca R2R to the Dahon MuP8 would be the wheelset, the frame, the handlepost, and the folding joints. These are the major components that account for most of the difference in price between those two bikes. The detailed facts have been laid out for your comparison, whether the MuP8 is worth the price or not, it is up to you to decide! Highly informative and easy to understand. Well thought out idea flow. Keep up the good job. I really enjoyed this article. Well written and informative. I did consider a folding bike but in the end decided on a Progressive 20 FS mini velo - nice light small bike with decent parts. Novatec Aluminum alloy front and rear hub and rims. SHIMANO FD-R44 front derailleur, SHIMANO RD-2200 rear derailleur, SHIMANO CS-HG50 12-25T 8S flywheel, SHIMANO SL-R440 gear shift, tektro r356 brakes, wellgo aluminum pedals. Tires are so-so only Kenda Kuest 20 x 1.25. I intend to change the brake pads to the ones you mention and the tires as well once I've worn then out a little. Any other component change you can recommend? the stock parts seem pretty OK for the bike. as a start, you may want to change the brake pads as you said. Kool-stop pads are good. Other changes to improve comfort would be the grips and the saddle. Hi, are the Kool-stop brake pads easily available at the LBS? Or only certain shop carrying the product? Not so commonly found. Hup Leong have them. You can also get it online. 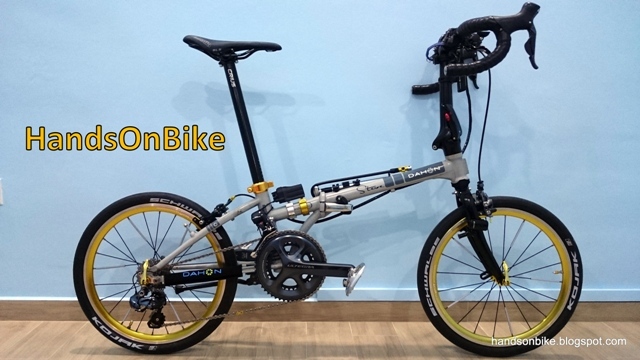 What is your opinion on Dahon folding bike made from China or Taiwan. Are there any actual differences in terms of its quality? The specs are sometimes different. Quality wise I am not sure, but I believe they have different factories because the Taiwan factory alone cannot cope with the quantity, which is why they split the manufacturing into different places. I read the whole series and thank you. Now i can rest assured that imade the right decision in having bought a tern p9. All i need now is to maintain and keep it in good condition. Found your blog yesterday evening. Just finished reading this article. Learned a lot. Thanks for the great effort. Thanks for the really useful resource, interesting to more fully understand some of the differences between cheaper and more expensive bikes! Thanks for the great effort to explain the technology difference between the bikes that are in a different price category. It has been enlightening. Really really interesting and informative. Thank you! Detailed review! Thank you for writing this! Really helped a novice like me understand the differences between generic and high quality bicycles.